In California, it's as dependable as the rainy season. Okay, more so. Whenever there's too much water or not enough, people start talking about Auburn Dam. 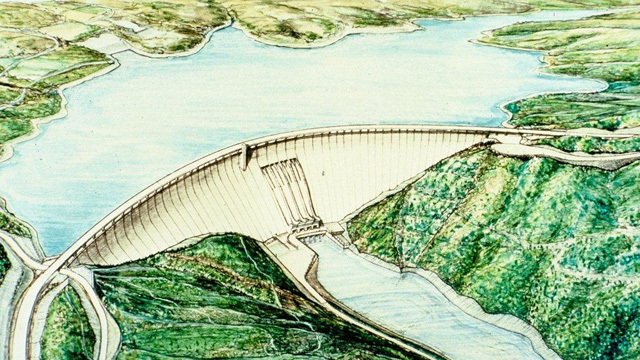 It's California's biggest dam that has never been built -- and probably never will be. The latest revival occurred at a recent show-and-tell for the new spillway under construction at Folsom Dam. Congressman Tom McClintock, R-Auburn, seized the occasion -- not so much for congratulations -- but to decry recent releases of water from dams on the American River. "It infuriates me that for the past three days, we have seen releases of water out of dams on the American River triple in order to meet environmental regulations that place the interests of fish above those of human beings." The congressman then pivoted and called for completion of Auburn Dam, a long-stagnant project on the North Fork of the American River originally green-lighted by Congress in 1965, near the end of what the late writer Marc Reisner called the "go-go years" of American dam building. McClintock's colleague from across the aisle, Sacramento Democrat Doris Matsui, sat nearby, literally shaking her head. 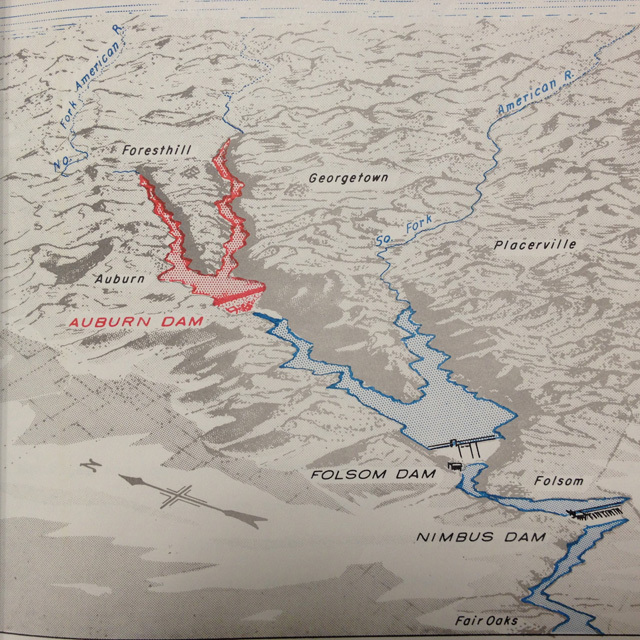 McClintock told the assembled dignitaries that a brimming Auburn Lake reservoir upstream, "could fill and refill Folsom Lake nearly 2 1/2 times." The current drought has left Folsom Lake at alarmingly low levels this spring. Indeed, the project, designed by the U.S. Bureau of Reclamation, would create one of the state's biggest reservoirs, with a capacity of more than 2 million acre-feet of water, about half the volume of Shasta Lake. Then McClintock took aim at Governor Jerry Brown's plan to construct bypass tunnels to carry water through the Sacramento-San Joaquin Delta. He went on to extoll other potential advantages, such as, "power for a million homes" and "a major new recreational resource for our region." Of course, those who enjoy (or profit from) rafting and paddling the scenic, frothy reaches of the North Fork have long taken a different view of the recreational potential, as those reaches would disappear under hundreds of feet of flat water. Auburn Dam was never completed but it was started. Reminders are still there, the most obvious being the Forresthill Bridge, a green metal and concrete ribbon that soars more than 700 feet above the American River, built to span a reservoir that never was. If you're more ambitious and hike down into the river canyon, you can still see where it was carved out on both sides to anchor the concrete arch. By 1975, taxpayers had already shelled out about $137 million for the project. But the following year, when a magnitude 5.7 quake occurred a little too close for comfort, Reclamation took a time-out to revisit the dam's design and work has never resumed. "The dam was redesigned to meet those seismic considerations," McClintock told me in an interview after his remarks at the spillway. "So yes, that’s already been engineered around." "We did not go back and do a full engineering analysis," said Drew Lessard, Reclamation's area manager for central California, referring to an updated study by the Bureau in 2006. He says that in the late 1970s, Reclamation did "move the location slightly," to minimize seismic impacts. Lessard says that moving forward now would require a full "reformulation study," reassessing the project's costs and priorities, and that such a study by itself would take years and cost millions of dollars. "You know, that thing’s been studied over and over and over again," said Matsui, in a separate interview. "And you know what? There’s no support for it." 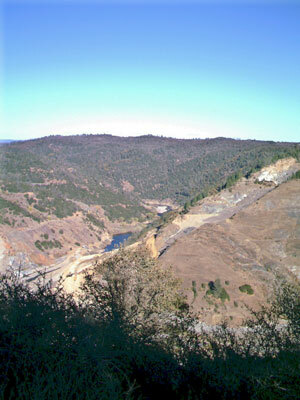 In 2008, the California State Water Resources Board revoked the water rights that had been set aside for the Bureau of Reclamation. Most water rights are a use-it-or-lose-it proposition in California, to prevent what the Board calls "cold storage," which is to say sitting on water rights without actually using the water. Many believed that was the final nail in the project's coffin.